During the summer of 2010, a forgotten archive of UCCs Clubs and Societies was discovered at the back of the Accommodation office on College Road. In it were extracts from a book which was being prepared for the “150 years of UCC” celebration in 1995. Unfortunately the book was never published and was abandoned along with the majority of the written work. An extensive search through the minutes, treasurer reports and old student publications along with an interesting read through John A. Murphy’s “The College” have unveiled a rich and diverse history of the most active campus in Ireland. The previous article in this series documented the beginnings of Clubs and Societies in UCC along with how they shaped our university in its early days. This article shows how these student run institutions survived and developed as the college and student population around them changed with the times. As previously mentioned, under President Windle (1904-1919) student services and societies were greatly increased in both magnitude and quality. Political involvement from students also increased dramatically near the end of Windles tenure and that was reflected in the UCC student publications at the time. With Windle moving to Canada in 1919, a new President, Patrick J. Merriman was elected; he would serve until 1943 and his tenure brought another explosion in the formation of student Clubs and Societies. The Great War (World War 1) and the execution of the leaders of the 1916 Rising provoked a strong nationalist reaction from the students within the newly established University College Cork (1908). Republicanism in the college was a far more formidable movement than the Blueshirts at the time, as was the case nationwide. 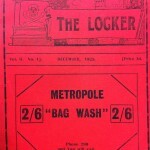 There is also an account, in the archives, of a discovery of explosives in the chemistry department, indicating bomb-making activities there during the civil war. But away from the political unrest at the time, much of the public interest in UCC in the late 1920s was concentrated on the new dairy science institute; the inaugural meeting of the Dairy Science Society (more familiarly known as Cowpunchers Society) in the Aula Maxima in December 1926 was described as a “memorable Occasion”. 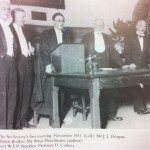 Other academic departments also began forming societies of their own with the Chemical Society starting in 1925, Biological Society in 1928 and the Law Society in 1929. The expansion of the college allowed for the departments to expand themselves and therefore increase student numbers. The completion of the Chemical and Physics building in 1911 (now the civil engineering building) and the Dairy Science Building in 1928 (now the Geology Building) contributed towards this expansion. Other Societies started at this time include the French Society in 1934, by the first female professor in the UK or Ireland, Mary Ryan. Also founded was the Academy of St. Thomas (1931) which was originally a literary and philosophical society which would later become the Iona Society. Other than societies and clubs, students had plenty of other opportunities for letting off steam in UCC. In the 1930’s, the Queen Victoria statue (replaced in 1934 by a statue of St. Finbarr) atop the Aula Maxima was clad in an undergraduate gown and the annual RAG days continued to flourish until they were abruptly terminated in 1944 by Alfred O’Rahilly. Conferring ceremonies in the 1920s and 1930s were marked by scenes of chaotic student rowdiness with fireworks and flour bombs thrown into the Aula Maxima during the events. Throughout the 1920’s, balls took place primarily in the Aula Maxima, Main Restaurant and The Arcadia Ball Room near the train station; which was later demolished and rebuilt as apartments for student accommodation. It was suggested by the editor in the student magazine (The Chronic) in January 1920 that Dances should be held in the “Exam Hall” (Aula Maxima) as this would cost much less than hosting them downtown. 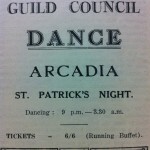 Unlike today, where each society may have a ball, there were only about three in the entire year, the Graduate Dance, College Dance (for all college students) and the Guild Council Dance (now called the Clubs and Societies Ball). It wasn’t until the 1930’s that dances became organised by societies such as the Chemical and Biological Societies Dance, first started in 1934. This Dance continued annually until the 1970’s (later joined by the Medical Society), making it the predecessor to the modern day Science Ball. All these events were well advertised by the student magazines. 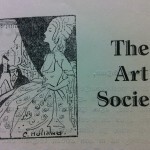 Student Publications in UCC also went through a very rough patch until the late 1920’s. Originally starting out as the Q.C.C., the student magazine then became The Quarryman for a time. 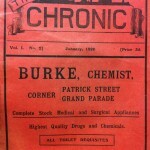 This was then dropped in favour of The Chronic in 1919/1920 but was then dropped again in favour of The Locker in 1924. It then seems, due to the war, and a “deplorable laxness” there was no magazine again until March 1929 when the students of UCC revived the old Quarryman name. This new Quarryman, which continued well into the 1960’s is a gem in student publications and serves as a great reference for societies, clubs and the Students’ Union. These student publications gave extensive coverage to the sports clubs which grew enormously with the formation of national and inter-varsity cups in various new sports throughout the 1920’s and 30’s. 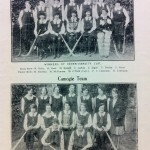 The UCC ladies keep the college at the top spot in both Camogie and Hockey in 1929 and the Athletic Club achieved two new records in the same year. 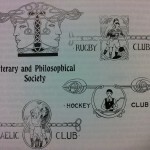 Rubgy was regularly referred to as the largest of the clubs in the college, in terms of members, while the hurling and football clubs often finished near the top of their leagues. By the 1930’s UCC had a huge selection of Clubs and Societies including a growing number of non-academic ones such as the Art Society, which was formed in 1931 by the famous composer Aloys Fleischmann, and the Chess Club was also formed in the early 1930’s. Societies were starting to attract local and national media coverage of their events, such as Seán Lemass’ address to the Chemical Society in 1933 entitled “Industrial Possibilities”. UCC was expanding- there were new departments and more students each year, but it was with the appointment of Alfred O’Rahilly as President that the landscape of UCC changed most. During the 1940s and 50s, the subject of the nect article in this series, Clubs and Societies would grow beyond all expectations.